Upgrading Galaxy Ace GT-S5830L to Latest Gingerbread 2.3.6 Firmware. Galaxy Ace GT-S5830L is a variant of Samsung Galaxy Ace GT-S5830 smartphone and the models which are sold in Americas are especially know by this (GT-S5830L) model number. In this article, I'll explain to you in details the step by step instructions to upgrade your handset with latest Android 2.3.6 Gingerbread firmwares. So, to begin with download a firmware for your region below and provided you have give requirements already (if you don't have them then download them too) we are ready to move ahead. Samsung Galaxy Ace GT-S5830L handset : I am sure everyone reading this article has it. Samsung USB Drivers : These are needed to connect your device to your PC. Note that if you have installed Samsung Kies on your PC then these drivers are also installed automatically with it, so you don't need them. 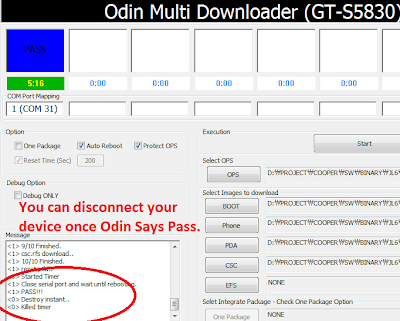 Odin Multidownloader v4.38 : This is used to flash/upgrade firmwares. Cooper_v1.OPS file : This file is needed each and every time you flash anything via Odin; let it be custom recovery or a stock rom. It contains instructions for Odin to be followed while flashing the rom. Latest Official Firmware : Download any stock rom from above or check out latest version at sammobile.com. So, when you've got everything up and ready follow these simple instructions below to upgrade your galaxy ace GT-S5830L to latest android version. 1. Now, extract your download and examine it. 2. If you have got a single .tar or .tar.md5 file then follow the steps give in Method A. Otherwise, if you have got two or more (usually four) .tar or .tar.md5 files then configure Odin as said in Method B. Method A : Configuring Odin For One Package file. Configuring Odin with one package file. Run Odin Multidownloader for Galaxy Ace GT-S5830L. Check One Package, Auto reboot and Protect OPS check boxes. Click on OPS button and Load Cooper_v1.0.ops file on it. Now go to the bottom and click on One Package button. Load the single *.tar or .tar.md5 file in this field. Selecting multiple files in Odin. Click on BOOT button and Select .tar (or .tar.md5) file with APBOOT in the name. Click on PDA button and Select .tar (or .tar.md5) file with CODE / PDA in the name. Click on PHONE button and Select .tar (or .tar.md5) file with MODEM in the name. Click on CSC button and Select .tar (or .tar.md5) file with csc / csc-multi in the name. 3. 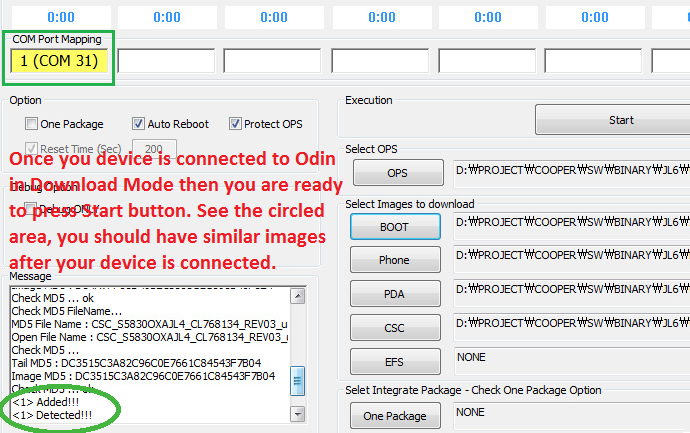 Now, once odin is configured, power off your galaxy ace. 5. Only when your phone is in download mode, then connect it to your PC via USB Cable. 6. Once connected in download mode, Odin will say Detected! (see the image below) and then you may press Start button. Do not proceed ahead until Odin recognize/ detects your device. 7. 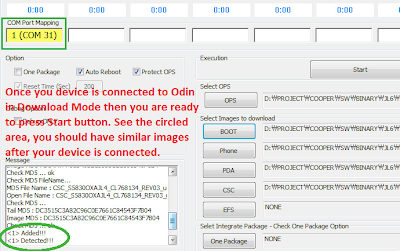 Wait for about 5-6 minutes for Odin to flash the firmware and then when it says PASS at the top left box, you may disconnect your device. Wait till Odin says PASS. This is the notification that your device is successfully upgraded. That's all. Now, you have latest gingerbread 2.3.6 firmware on your galaxy ace gt-s5830l smartphone. After your device boots up, you can take your time and examine all the cool new updates provided in the latest version. No doubt you are going to love them. So, have fun playing with your smartphone and enjoy :).